Exclusive ArcReach technology uses existing weld cables to communicate process adjustment commands back to the welder generator. With an ArcReach system, amperage & voltage are conveniently located at the operator's fingertips — not back at the power source. Unlike traditional DC style generators that have a hard time maintaining a consistent output due to daily fluctuations in ambient temperature, the advanced controls on the PipePro stabilize and keep output right where you set it. Unlike conventional DIG that provides a preset amount of short-clearing current, Miller’s proprietary Dynamic DIG works on a time-based algorithm that automatically adjusts the amount of current required to clear a short. What does this mean? A smoother more consistent arc that can be tailored to match application, material, fit-up, and welder technique. Workbench tough top cover provides superior impact, corrosion and abrasion protection. 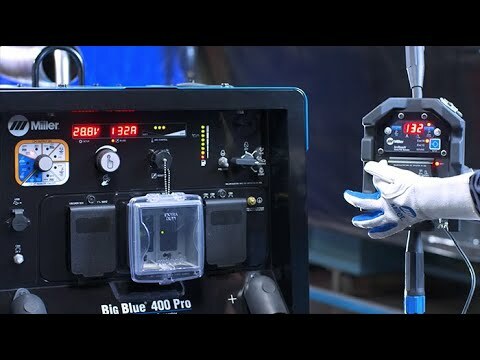 The Big Blue 400 PipePro is the smallest, lightest and most powerful welder in it’s class. This means less wear & tear on the truck chassis, more room and capacity for equipment, and greater visibility out the rear window of the truck. Eliminate pesky control cords and remote boxes through the use of Miller's wireless hand control (#300430). 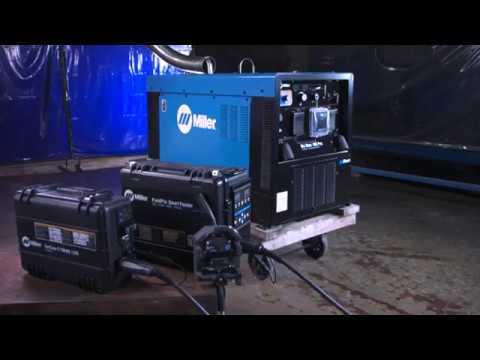 Easily control welding output up to 300 ft. away from the Big Blue without ever having to make a trip back to the truck. Wireless Antenna Kit recommended (#300749). For Big Blue® 400 Pro, 400 PipePro® and 450 Duo CST™. Prevents particles from leaving the muffler that could potentially start a fire. Mandatory when operating on California grasslands, brush, or forest-covered land, and in all national forests. Meets U.S. Forest Service Standard 5100-1B. Local 798 Union pipeliner Tyler Sasse visited Miller to try out new Dynamic DIG technology.